There’s no denying it: Things are continuing to fall apart for embroiled Fox CEO Roger Ailes. The 76-year-old Ailes has been accused of pervasive and systemic sexual harassment by numerous current and former female employees, and the way-too-late, completely underwhelming response he released this morning has done little to improve his image. 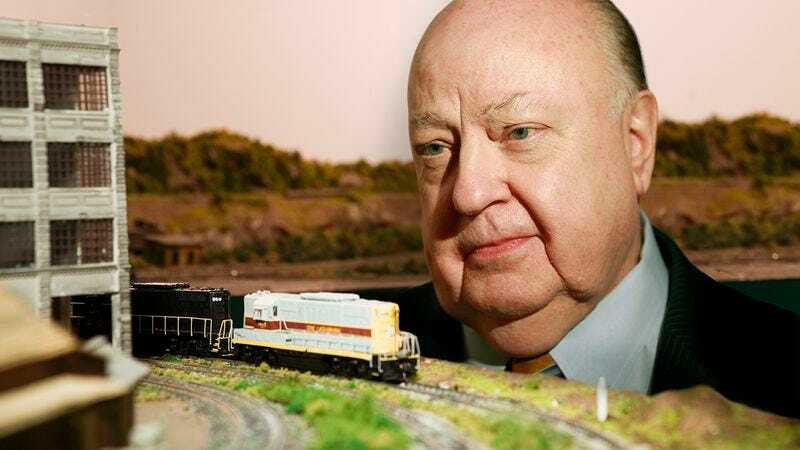 Three weeks after the accusations began, Ailes has only now put up signs denouncing sexual harassment in the town hall of his miniature train set. Uh, nice try, Roger. If you really wanted to apologize, why weren’t you putting these types of posters up around your toy train set when the news first broke? As part of his seemingly last-ditch effort to smooth over a tenuous situation, the Fox executive reportedly descended to his basement early this morning and started putting up posters condemning inappropriate sexual behavior all around the hand-painted train station in the model town he has set up. Seems great at first, right? Well, while it’s nice that Roger has put up signs that say things like “No means no” and “Protect your employees, not your reputation,” these 2 cm x 2 cm posters adorning Ailes Pine Grove Station are coming far too late in the game to mean anything to any of the women who he has hurt over the past 20 years. No matter which way you look at this, it’s hard not to question why Ailes’ train station was totally devoid of these powerful messages just mere days ago. Yes, it’s considerate that he put the posters in the central station and not an out-of-the-way building like the post office, but maybe, if he really wanted to be a “good guy,” he wouldn’t have put up those posters in the first place. Sorry, Roger, but if you really felt remorseful for your disgusting behavior, you should have resigned and issued a public apology or put up the anti-harassment posters in your model train station way sooner. Unfortunately, the damage has been done, and it seems like nothing Roger Ailes does to the train set in his basement now will undo it.